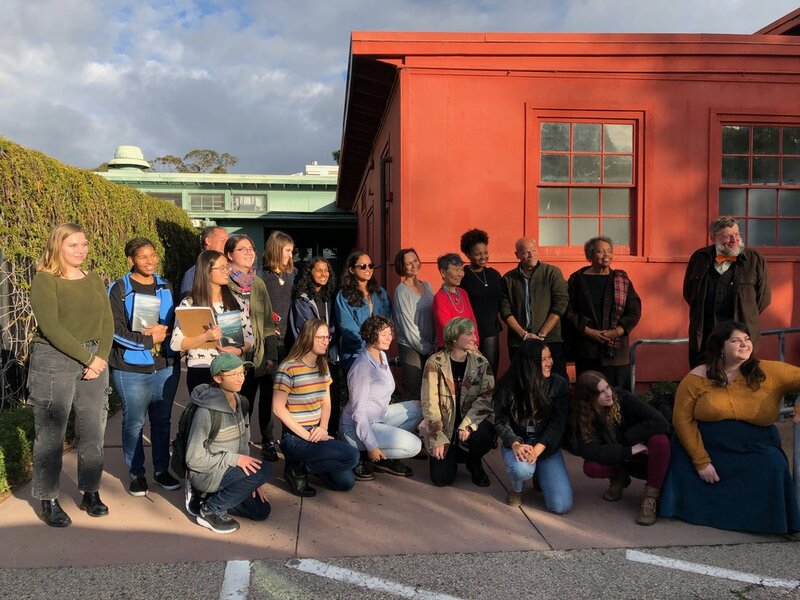 Students sat attentive and eager to hear Tracy K. Smith, the 22nd Poet Laureate of the United States, speak about her poems and writing process at UC Santa Barbara last week. Shirley Geok-lin Lim, an English professor at UCSB, led the conversation with Smith in front of other faculty, poets and aspiring student poets in the Writing Program, English Department and the College of Creative Studies. The intimate talk in the Old Little Theatre took place before a larger event in Campbell Hall where Smith recited her work, sold her books and signed them for UCSB students and the public. U.S. Poet Laureate Tracy K. Smith answers a UCSB student’s question on her process for writing and revising her award-winning poetry. In her role as the U.S. Poet Laureate, Smith tries to focus on people who are uncomfortable or unfamiliar with reading and writing poetry. “Part of what I’m hoping to do as Laureate is to make people feel at ease with this art form, that it’s not out to get them, that it’s not out to make them look dumb, despite the way that it is sometimes taught,” she said. In addition to her own poetry, she edited a book geared toward people who may be skeptical about poetry and who need it to be more accessible. The book, “American Journal: Fifty Poems for Our Time,” includes poems by American poets that use familiar language or familiar aspects of everyday life in order for readers to feel a connection. Smith said she hopes that by doing this, people will understand the art of poetry and even eventually write their own. Smith always knew she wanted to be a writer. While an undergraduate at Harvard she found a creative community. “I was suddenly in this space where I could hear poets read and talk about their work,” she recalled. Smith found herself for the first time surrounded by people who were confident with what they wanted to do in life. “I had peers who were not just saying ‘I want to be a writer when I grow up,’ they were saying: I’m a poet,” she said. Smith reminisced about her childhood, recounting that her first poem was written when she was ten-years-old. “The poem was called ‘Humor.’ The last two terrible lines were, with humor speaking: ‘Treat me with respect, for I shall do you good for years to come’,” she said. Although she laughed about this memory, Smith said she felt this poem was her first profound statement. The English department’s Geok-lin Lim asked Smith about her writing process for publication, in both poems and books. “Publication brings you into the wider conversation,” she said. But Smith never intends to write a whole book or just one poem when she starts writing. “For me the magic number is 53 pages on my computer, once I get to 53, I say ‘okay, now I get to start thinking about a book’,” she said. UCSB students and faculty posing with U.S. Poet Laureate Tracy K. Smith after her talk, in front of the Old Little Theater. Smith said her writing process was influenced by a teacher who told her that a line of a poem is more specific than an idea. “The line has to create the feeling of when you’re asking somebody where the beach is, a muscled arm appears and goes, ‘It’s that way.’ It’s sculpted, it’s purposeful,” she said. Every line of a poem needs to be there for a reason, instead of filling up space to make the poem longer. A student in the audience asked if there was a place Smith usually goes when writing poetry. “My favorite place is at home with nobody else in the house,” Smith responded. “Looking out a window and listening to those birds and looking out thinking nature could help offer clarity on what I’m thinking about.” She explained that she is always listening when writing because she believes that possibilities can come from anywhere. “My end game is to keep publishing books, but my more immediate goal is to keep writing poems,” Smith said, adding that writing poetry is a daily practice. She carries a love for every poem she writes. “Those poems I’ve written, they have a life, a very private one,” Smith said.